Republicans made a series of unsuccessful decisions months before embattled GOP Senate candidate Roy Moore was accused of sexual misconduct that led to Democrats picking up a deep-red seat. It all began with President Donald Trump choosing then-GOP Sen. Jeff Sessions as attorney general. New York Times reporter Alex Burns laid out all of the missteps in a Monday Twitter thread. 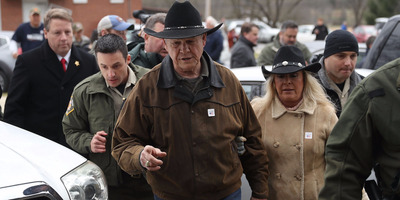 Well before allegations of sexual misconduct with teenagers changed the conversation around Alabama’s special election, the GOP made a number of questionable choices that ended with Republicans losing a virtually guaranteed Senate seat in the deep-red state of Alabama. New York Times reporter Alex Burns posted a series of tweets on those “extraordinarily unsuccessful series of choices” Monday night, laying out all the moves that culminated with Democratic nominee Doug Jones finding himself as Alabama’s next senator-elect late Tuesday night. It began with with President Donald Trump’s decision to name then-Republican Sen. Jeff Sessions, who held the Alabama seat that Jones and his Republican challenger Roy Moore fought for, as attorney general. Republicans, facing a series of decisions for what to do with the seat, miscalculated. Burns went through each decision in “choose-your-adventure” form. It took an extraordinarily unsuccessful series of choices, by Republican leaders, to make the Alabama race competitive even *before* the Moore scandal. Let’s review them in choose-your-adventure form. (1) Take a big sip of coffee and check the website of the Washington Post. (2) Take a HUGE sip of coffee and check the website of the Washington Post. I hope you’ve all enjoyed this game. The point, obviously, is that if at any point, any of the other paths had been taken, Rs might never have had to worry about this election in a serious way, or find themselves painted into a corner with Roy Moore when the scandal broke. Jones defeated Moore, alleged of sexual misconduct with teenagers when he was in his 30s, by roughly 1.5 points in Tuesday’s election. That’s a drastic change from 2016 when Trump defeated Democratic presidential nominee Hillary Clinton by nearly 30 points in the state.